More Cities and Towns: Alleman, Altoona, Ankeny, Bondurant, Clive, Elkhart, Grimes, Johnston, Mitchellville, Pleasant Hill, Polk City, Runnells, Saylorville, Sheldahl, Urbandale, West Des Moines, Windsor Heights. Population (July 2002 est. ): 385,691. 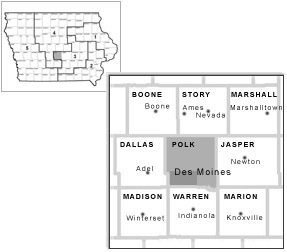 - 13.13% of total IA population of 2,936,760. POLK: CD 3. 183 of 1,993 precincts. Registered Democrats (Active Jan. 1, 2004): 81,809. - 15.35% of Democratic statewide total of 533,107. 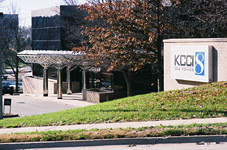 Delegates to 2004 State Convention: 430 of 3,000. - 14.3 %. County Delegates Elected in Precint Caucuses: 1,200 of 13,487. Attendance: 22,092. -17.77% of statewide total of 124,331. Note: Lieberman and Sharpton received no precinct level delegates. Polk County Reg. (Active Jan. 1, 2004): Rep. 70,753 (31.35%) Dem. 81,809 (36.25%) NP 73,135 (32.40%) Total: 225,697. 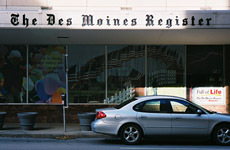 Total IA Reg. (Active. Jan. 1, 2004): Rep. 584,513 (32.10%) Dem. 533,107 (29.28%) Grn. 108 NP 703,106 (38.61%) Total: 1,820,834. County Secretary: Nita Noble . Titles and affiliations are listed for identification purposes only. Based on information provided by the campaigns. These names have not been confirmed; due to the fluid nature of the campaign some activists on earlier lists may have changed their allegiances. Rob Tully - Galligan, Tully, Doyle & Reid, P.C. 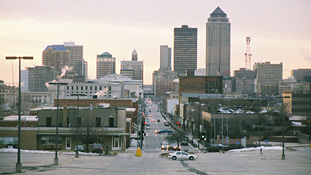 in Des Moines; chair of the Iowa Democratic Party, 1999-2001. Roxanne Conlin - Roxanne Conlin & Associates, P.C., Des Moines; Democratic nominee for Governor, 1982. Ed Skinner - attorney, longtime Democratic activist, former member of the Iowa Democratic Party's State Central Committee, and father of State Rep. Geri Huser. statewide African-American newspaper, editor Jonathan Narcisse. Jerry Crawford-Des Moines attorney who has chaired the Polk County Democrats. He was state chair for Dukakis in 1988 and worked on the Mondale, Clinton, and Gore presidential campaigns. Jack Dewey, Des Moines ...Air Force, WWII. John Feller, Des Moines ...Merchant Marines, WWII; Navy, Korea. Mark Wallace, Des Moines ...Army; National Guard. Alexander McIntyre, Des Moines ...Army, WWII. 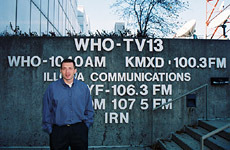 Greg Cross - UE International Representative, Des Moines. Paulee Lipsman - House Democratic director, ex-DNC member. Tim Brien - Polk County Recorder. Steve Wandro - Des Moines attorney. Som Baccam - Des Moines School Board member. Jo Corigliano - chair, South Des Moines Revitalization Partnership. Ray Blase - Bureau Chief, Polk County Attorney's Office. Laura Sands - Des Moines School Board member. Publisher: Mary P. Stier Ownership: New York Times Co.